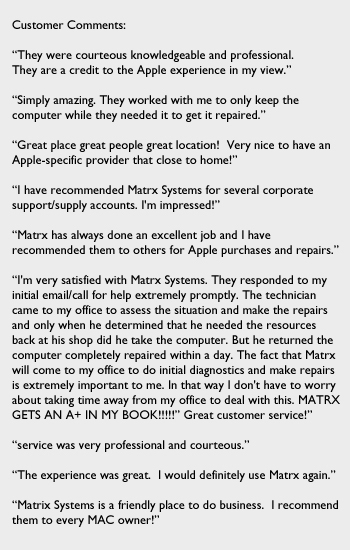 We are here to solve your out of warranty Mac problems! Our Experience gives our customers confidence and enhances our reputation. Any repairs performed by an unauthorized repair center will void your warranty. Our Apple Certified Macintosh Technicians conduct diagnostics, facilitate covered repairs, modifications, alterations and upgrades on Apple products. We actively promote the Apple brand as part of our business products. We handle all out of warranty repairs with the same care and high standards you have come to expect. PLEASE NOTE: WE DO NOT OFFER IPHONE AND IPAD REPAIRS.